The 2016 Hiking Spree is underway at the Highlands Center for Natural History. 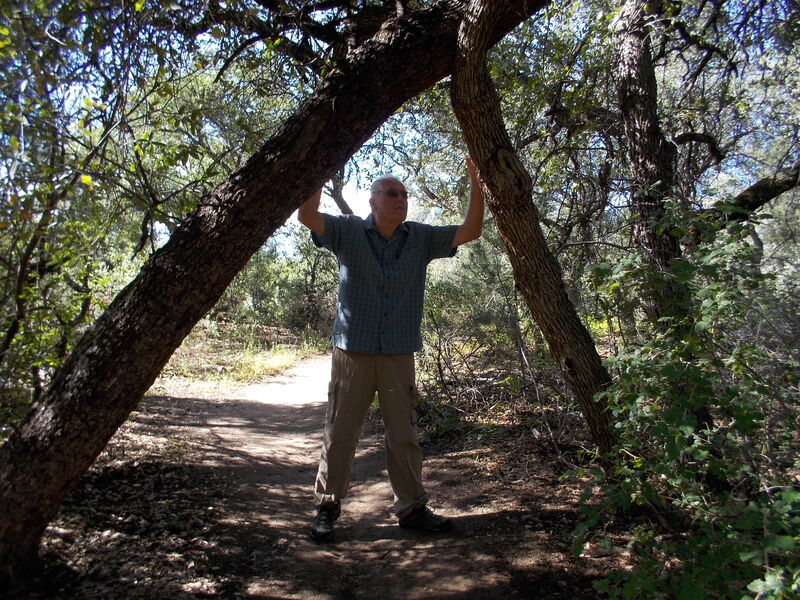 For our third hike, we chose the spectacular Constellation Trail. 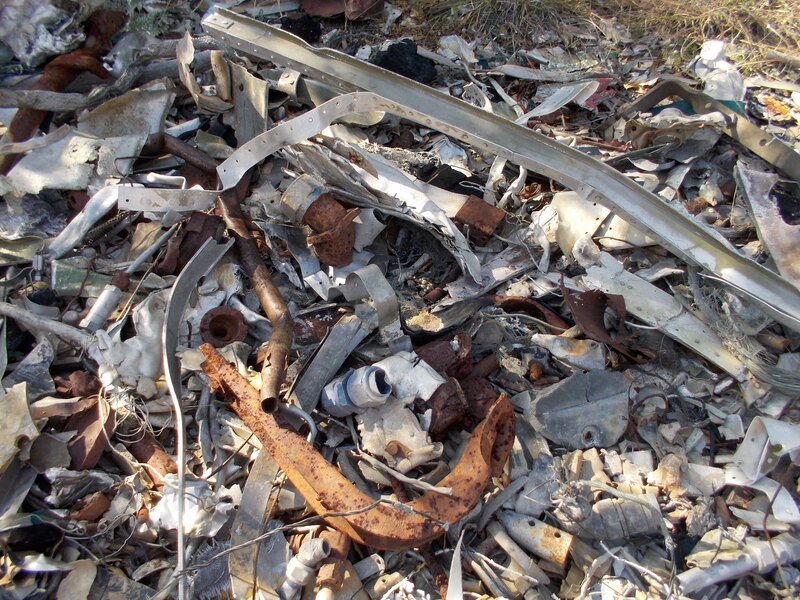 It is located at the site of the 1959 crash of a Lockheed Constellation. 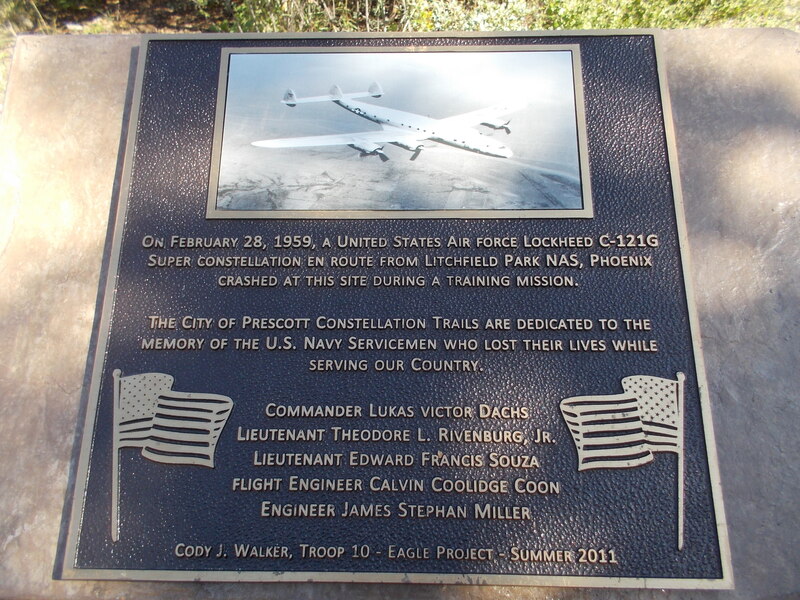 A memorial to the five men who died there can be found at the beginning of the trail as well as pieces of the wreckage. The trail is west of Highway 89, just south of Highway 89-A. You can park in the lower parking lot at Phippen Museum and use the tunnel to go under Highway 89. The Constellation is actually made up of small loops inside a large loop. This allows hikers to plan short and long hikes. But you’ll want to allow plenty of time. No matter what my plans, I always end up spending more time than I expect. I get caught up in the wonder of it all. It had rained hard the day before leaving water along the way, but most of the trail was dry. 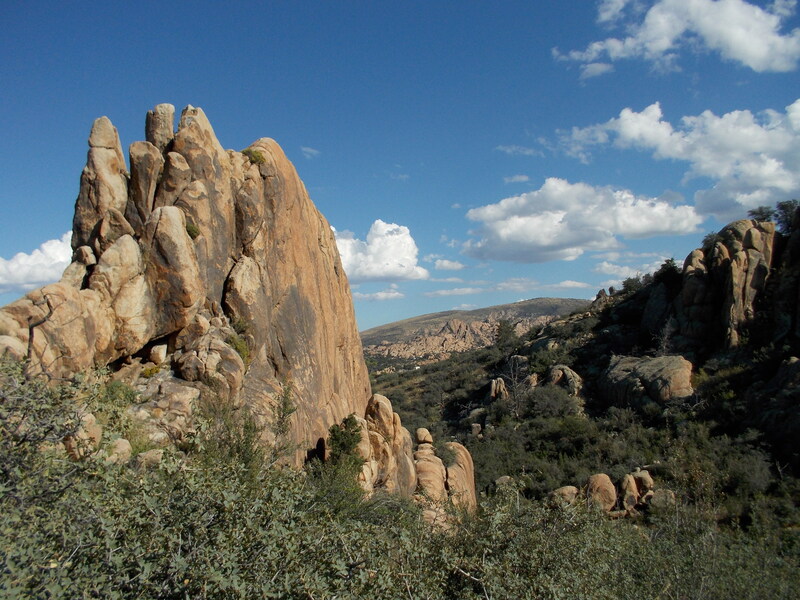 We began our hike on the North 40, which goes along the base of the large granite formations. Then we took a newly added loop called Ham and Cheese. The trail wove through the granite rocks as if they were made of Swiss cheese, making us feel like we were part of the sandwich–Does that mean the hikers are the ham? Next we took a trail called the Hully Gully. A walk across the face of granite rocks (the Hully) led us to a flower-lined gully. Our next leg of the hike was the Lost Wall. This part was steeper than the other parts of our hike. I was envious of the lizards that made it seem so easy to go up the granite boulders. But then they do have four feet instead of two and a much lower center of gravity. 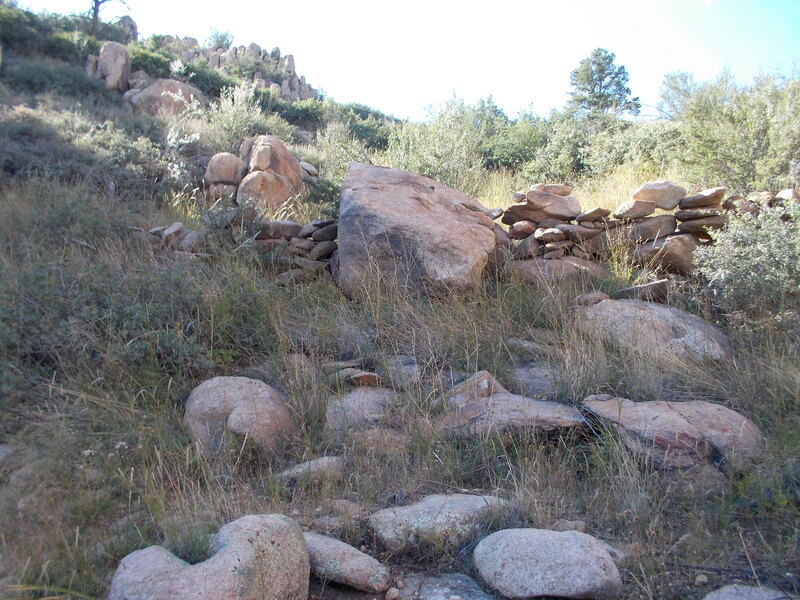 The lost wall is part of what was probably a sheep pen, built more than one hundred years ago. 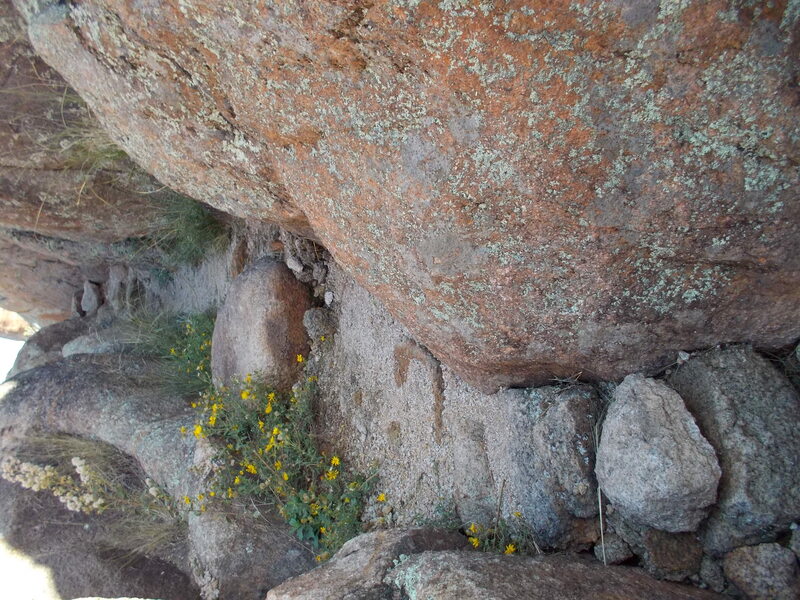 We skipped the Hole in the Wall loop that goes steeply up through a crack between the rocks. We have done that trail before and it is a fun one. Returning back to the trailhead via the Rock Wall Trail, we were treated to picturesque views of the Dells along with unbelievable rock formations. I hope you have the opportunity to explore this amazing trail. 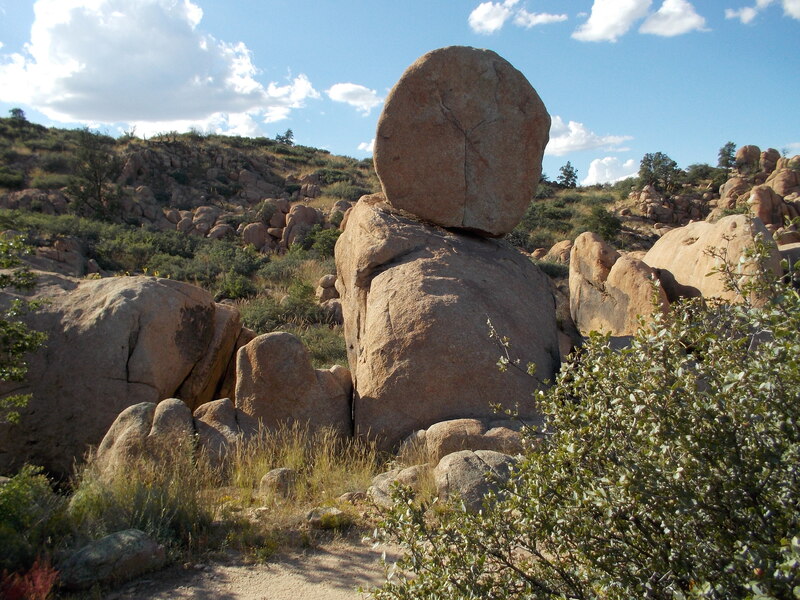 Don’t rush–You’ll want to stop often to enjoy the scenery that makes hiking the Granite Dells a unique experience.